We are about to depart on our flight to Miami, where we pick up a redeye to Santiago, Chile, for the first leg of our journey. So now would be a good time to set the stage for our destination. The country is a stable democracy but as you probably know has had a tumultuous history. The first European to lay eyes on it was Magellan in 1520, and in the decades that followed the Spanish did what they were best at in those days, which is that they colonized the place and made it a living hell for everyone. The country was granted independence in 1810 and kind of puttered along with a series of governments into the 20th century. Things got really interesting in 1970 with the election of Salvador Allende, whom the US did not like, not at all. They feared that he was a Marxist who would destroy the Chilean economy, get into bed with Cuba, and consort with the KGB. Somewhat uncharacteristically, these all turned out to be true. And so the US government did the logical thing, which was to engage him in dialog while strengthening ties with Chile’s neighbors and applying political and economic pressure to exact peaceful change. Ha ha! Just kidding! We used the CIA to support a coup, of course. In fact, the only surprising thing is that we didn’t actually bomb the country, but that’s probably because Predator drones had not yet been invented. Anyway, the coup brought Gen. Augusto Pinochet to power in 1973, and as in many such CIA interventions the country settled into an era of comparative peace. Don’t be fooled by the white gloves. Well, the economy did substantially approve, but at a hideous price. 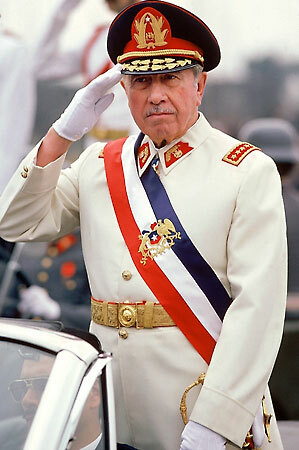 Tens of thousands “disappeared” under Pinochet, and things got so awful that even his own henchmen got uncomfortable. In the late 80’s things loosened up considerably, to the point that Pinochet assented to hold a plebiscite for him to remain in office. The vote was pretty much rigged but Pinochet remarkably managed to lose anyway, and left the country in 1990, and an actual legitimate government was seated. Things have actually gone pretty well since then, with a lot of economic growth and an actual democracy. Among other things, the country has become quite the astronomy mecca. The Andes and Atacama Desert (the latter being our second destination) are the hosts of the largest collection of observatories in the world. The Atacama site in particular is one of the best telescope sites on the planet, comparable to Mauna Kea in Hawaii. More on Atacama when we get there in a few days. But first, we will have a day or two in Santiago, the capital and largest city. Officially founded in 1541, it is named after Saint Iago, the highly-specialized Patron Saint of Unctuous Evil Manservants Who Trick Their Masters Into Murdering Their Wives. No, wait, that’s not right. I may be confusing him with Saint Uriah Heep; they’re a lot alike. Never mind. I am confusing the Dickens out of my Shakespeare. Santiago is actually named after Saint James of Spain. It has a population of about 4M and sits in a bowl-shaped valley, one consequence of which is that it is known for having the worst pollution in the country. But it is otherwise supposed to be a very pleasant city. I have a lot of astronomer and other friends who have visited here who speak highly of it. But we’ll know more ourselves in a day or so. Stay tuned.